Access the entire Asian Security market through SECON 2019! 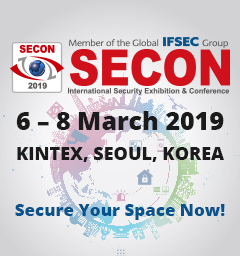 SECON 2019, which is the leading security exhibition in Korea, will be held from 6-8 March 2019 at KINTEX, Seoul, Korea. As one of the global IFSEC events, SECON will host more than 500 exhibitors and 45,000+ qualified trade visitors, decision makers from Korean and Asian Market. • Lead global security trend with advanced security products and brands from global leading security enterprises. • Perform a role as a test-bed to global security products and brands considering an entry into Asian security market. • Powerful networking with IFSEC Global Events and other IT/Physical Security Events organised by UBM. For more information, please visit us at www.seconexpo.com or email to global@seconexpo.com.